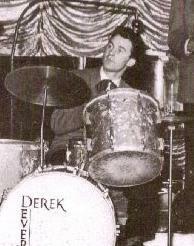 Derek (Dickie) Devere was born in 1928 as Derek Paul Rainbird. He played drums from the age of ten and had his own band at the age of sixteen. He toured Europe with Combined Services Entertainments before returning to Britain to work with Eddie Thompson and Stan Tracey in 1949. He was playing a summer season on the Isle of Wight when Kenny Graham heard of him and hired him after hearing him play for just twenty minutes. He spent two years with Kenny Graham's Afro-Cubists in the early 1950s and after a brief spell with Tito Burns in 1951, including a tour to Scotland with Burns' big band with Tubby Hayes, he returned to the Afro-Cubists. From November, 1951 to April, 1952 he worked with Revell Terry in India. On his return to London he was with Johnny Rogers-Lennie Metcalfe Jazz Inc in 1953. Even briefer spells followed with Lew Stone, Harry Roy, Tommy Pollard, Kathy Stobart, Ronnie Scott and Eddie Thompson before health problems caused him to quit playing at the end of 1953. He was "off the scene" for six years and after working as a clerk for a year returned in 1959. He made a brief comeback with Alan Clare at the Downbeat club in the autumn of 1959 and the Peter King Quartet in December, 1959. 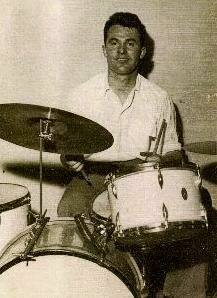 Dickie Devere was widely regarded as the best British modern jazz drummer in the 1950s, and he was said to have coached Phil Seamen and Jack Parnell among others. 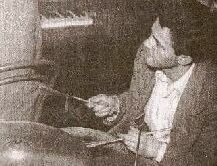 He wrote for the Melody Maker in 1951 on various technical aspects of drumming. These articles with titles such as "Modern-style drumming-and future trends", "Independency of hands", and "Finger style: a letter" marked him out as a man very serious about jazz drumming. He was a popular figure regarded as a "character". Writing in the Melody Maker in 1959 Bob Dawbarn said: "A beer with Dickie is a complicated procedure usually involving quick-fire gags, a short drum lesson and an incredible display of verbal gymnastics..."
Brian Davis, the jazz writer said of him: "He was admired greatly by Phil Seamen who had been known to stand quietly (something indeed) just agape at Devere firing the Afro-Cubists to incredible heights. His technique, the fastest I have ever witnessed, allowed him to execute a veritable fund of ideas with whiplash precision and could he swing!..." Kenny Graham rated him very highly and signed him for the Afro-Cubists the first time he heard him. He used to tell the story of how he would fail to come back in after one of Dickie's breaks because it had been so original and unexpected. Dickie for his part reckoned: "Kenny was the biggest influence in my life so far as jazz is concerned....He is the Governer...he taught me the fundamentals of jazz..."
Richard Rainbird adds the following: Dickie Devere played at the "First International Jazz Fair" that opened in Paris on December 1st, 1950 as a member of Kenny Graham's Afro-Cubists who combined with Humphrey Lyttelton for a 45minute BBC radio link heard at the Fair. Devere worked in the US although it is not clear precisely when. Towards the end of his life he worked with Graham Bond and Ginger Baker's Air Force. Like many jazz legends Devere left very little in the way of a recorded legacy. It is thought he may have recorded with Stan Getz or Sonny Rollins while he was in the US but I have found no evidence of this. According to Lord's Jazz discography" he took part in just three recording sessions - all with Kenny Graham's Afro-Cubists on February 10th, 1951, June 4th, 1951, and October 8th, 1952 where ten titles were recorded. This page was last updated during August, 2014.